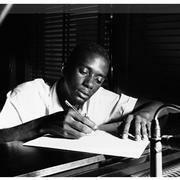 小简介 Bobby Timmons1935年12月19日生于美国费城，1974年3月1日在纽约去世。 Bobby Timmons 最为乐迷所熟知的是他那些带有福音、Funky风格的作曲，以至于他那些Bud Powell风格的bebop钢琴技艺反倒被人们忽略了。Bobby Timmons从6岁开始学习钢琴，在费城爵士乐圈子展露头角后又来到纽约，先后与众多著名乐手合作，1956年加入Kenny Dorham的Jazz Prophets乐团，1956-1957年与Chet Baker，1957年与Sonny Stitt，1957-1958年在Maynard Ferguson大乐团。 真正让Bobby Timmons成名的是他1958-1959年加入Art Blakey的Jazz Messengers，以及1959年加入Cannonball Adderley五重奏。这两组乐团的成功Bobby Timmons功不可没。他为Art Blakey写了经典的Moanin&apos;一曲，而且专辑Moanin&apos;也成为了Art Blakey在Jazz Messengers生涯中最重要的专辑之一。1959年Bobby Timmons与Cannonball Adderley合作时所写的“This Here”（收于专辑Cannonball Adderley quintet in San Francisco），以及接下来的"Dat Dere"（收于专辑Cannonball Adderley：them dirty blues），都成为了热门曲目。 1960年Bobby Timmons又回归Jazz Messengers待了一小段时间，之后在Riverside公司旗下作为leader开始录制唱片，组成了自己的三重奏，但始终无法取得如Jazz Messengers时期的那种成功。Bobby Timmons似乎被自己早期作曲方面的成就所束缚，没有找到新的突破。此后，他的音乐生涯开始走向下坡，本人也受酗酒的困扰。38岁时Bobby Timmons死于肝硬化. Bobby Timmons became so famous for the gospel and funky blues clichés in his solos and compositions that his skills as a Bud Powell-inspired bebop player have been long forgotten. After emerging from the Philadelphia jazz scene, Timmons worked with Kenny Dorham (1956), Chet Baker, Sonny Stitt, and the Maynard Ferguson Big Band. He was partly responsible for the commercial success of both Art Blakeys Jazz Messengers and Cannonball Adderleys Quintet. For Blakey (who he was with during 1958-1959), Timmons wrote the classic Moanin and, after joining Adderley in 1959, his song This Here (followed later by Dat Dere) became a big hit; it is little wonder that Adderley was distressed when, in 1960, Timmons decided to return to the Jazz Messengers. Dat Dere particularly caught on when Oscar Brown, Jr. wrote and recorded lyrics that colorfully depicted his curious son. Timmons, who was already recording as a leader for Riverside, soon formed his own trio but was never able to gain the commercial success that his former bosses enjoyed. Stereotyped as a funky pianist (although an influence on many players including Les McCann, Ramsey Lewis, and much later on Benny Green), Timmons career gradually declined. He continued working until his death at age 38 from cirrhosis of the liver.